Through twitter I have made many great running triathlon and overall athlete friendships. Lately, I have been thinking a lot about the friends I have from HS and college and realizing that with training being such a big part of my life we don't have as much in common as we once did. Don't get me wrong I love them but I can't talk about my long runs and the torture of sitting on a bike for an hour or 2 with them. It is nice to have friends (esp. female friends) that can relate and are doing the same. That being said- one of my best friends from college just decided to take up running. She asked me how one would go about training for a 5k. I sent her to the couch to 5k plan. She was so excited to start. After just having twins she was ready to start a new challenge. I got so many excited phone calls after a run. It is great to help others find the fun in this sport. D and I are headed to go visit her soon and we are all planning to race- her first 5k! So exciting! My twitter friendships with kissing frogs and getting stronger, burning fat have now brought me into a group of women that run for the Luna Chix running team. 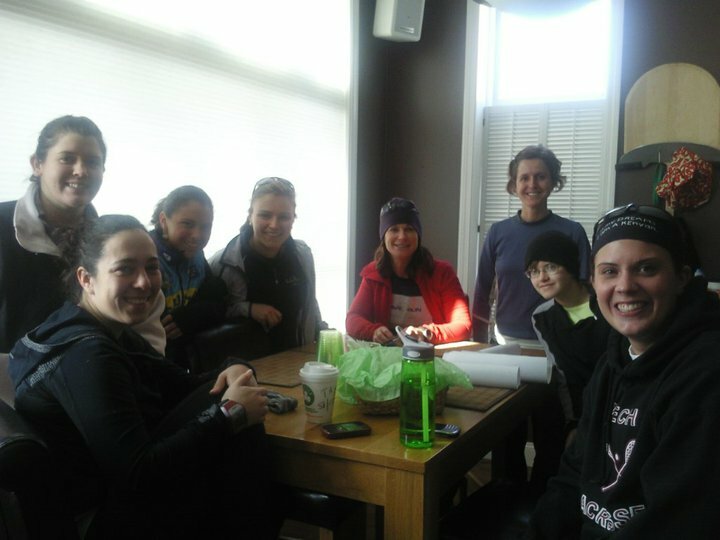 I did a hill repeat workout with them in Boston on Saturday followed by brunch with a great group of women! Not only did we all have running and training in common but they were all intelligent and fun to be around! I had a great time! Since kissing frogs, getting stronger, burning fat and I are all running the Hyannis half marathon at the end of Feb. We decided to get together and do another long run on Sunday. My legs were sore from the hills and the slushy mess that we had to go through made it a bit more of a workout. But we trudged through and got a nice long 9.5 miles in. Let me tell you the whole theory group suffering makes it better was true. I wanted to stop so many times but kissing frogs and getting stronger, burning fat wouldn't let me give it up! They were great pushing me through the run! Thanks ladies. It is great to have running/training support. Looking forward to our next long one!!! So glad that we met. I had a fantastic weekend after a month of no running! Can't wait for some more great times! i agree with ashley - it's been so great to chat with you over twitter and finally meet in real life. i always feel as though finding a good running partner is like dating - not everyone works. but i had such a good time with you and ash on sunday!